Several routes involved in metal uptake by plants from soils and metal translocation within the plants were studied . These routes include uptake of bioavailable metals, metal chelation and compartmentation in roots, metal translocation from root to shoot, and metal chelation and compartmentation in leaves [2, 3]. Zinc is one of the most common elements in the Earth's crust. High concentration of Zn can cause the phytotoxicity which can inhibit metabolic activities and result in growth retardation and senescence in plant. Excessive Zn can also give rise to Fe, Mn and Cu deficiency that reduce the transfer of those micronutrients from roots to shoots . A medicinal plant Centella asiatica has been used widely in folk medicine for hundreds of years to treat a wide range of illness . These plants were used to treat various illnesses thus awareness of the toxic effect of the medication due to the presence of excessive Zn accumulation shall be of public concern. In Malaysia, Zn concentrations have been reported in mussels  and sediments . However, Zn concentrations in terrestrial soils in relation to C. asiatica are lacking in the literature. Zn contamination of natural soil resources can be easily understand through this study which has emerged as an important issue due to the extension of urbanization and industrialization in Peninsular Malaysia. The objective of this study was to assess the potential of C. asiatica as a good biomonitor of Zn pollution based on correlation analysis of Zn between the plant and their topsoils collected from the field. In this paper, the Zn data from 9 sampling sites from Peninsular Malaysia (Fig. (1), Table 1) in the leaves, stems and roots of C. asiatica, and also their habitat topsoils were cited from , in which the data were presented in graphs. Briefly, the plants of 2-4 months maturity were collected and placed in plastic bags. The four geochemical fractions of Zn data in the soils were also cited from . However, Ong et al. did not report the relationships of Zn levels between the plant parts and different geochemical fractions of the habitat topsoils specifically. Fig. (1). Map showing the sampling sites for Centella asiatica in Peninsular Malaysia . Table 1. Sampling sites, sampling date and sites description of Centella asiatica in Peninsular Malaysia . 1. Pontian, Johore 9 May 10 Near a plant agriculture area. 2. Kampung Simpang Renggam (KSR), Johore 9 May 10 Near a housing area. 3. Seremban, Sembilan 4 June 10 Near shop lots and road sides. 4. Kapar, Selangor 5 June 10 Small scale housing area. 5. Universiti Putra Malaysia (UPM), Selangor 5 June 10 Near agriculture area. 6. Butterworth, Penang 12 June 10 Near an industrial area and highway. 7. Kluang, Johore 19 June 10 Near paddy fields. 8. Karangan, Kedah 12 June 10 Near oil palm plantations. (PPauh), Penang 12 June 10 Near a housing area and highway. Briefly, the sampling and analytical procedures of Zn can be found similarly as . The separated plant parts (leaves, stems and roots) and the sediments were then dried in an oven for 72 hours at 60°C to constant dry weights. About 0.50 g of dried plant tissue parts were weighed using an analytical balance. Ten ml of concentrated nitric acid (AnalaR grade, BDH 69%) were added to a digestion tube to digest the plant tissues. For sediments, they were sieved under 63µm followed by sequential extraction technique (SET) . Three replicates were done for each sampling site. Then, the digestion tubes were placed in a hot block digester at 40°C for 1 hour and 140°C for at least 3 hours . After dilution, the solution was filtered through a Whatman No. 1 filter paper into an acid-washed pill box until Zn analysis by using an air-acetylene Perkin-Elmer™ flame atomic absorption spectrophotometer model AAnalyst 800. Standard solutions for Zn were prepared from 1000 ppm stock solution provided by MERCK Titrisol. Geochemical fractions of Zn in the sediments were obtained using the modified SET (Sequential Extraction Technique) described by . The four fractions ‘easily, freely or leachable or exchangeable (EFLE; F1)’, ‘acid-reducible (AR; F2)’, ‘oxidisable-organic (OO; F3)’ and resistants (R; F4) were employed . There are two geochemical indexes involved in this study which are geoaccumulation (Igeo) and enrichment factor (EF). Bn = the background reference values. The background references values for Fe and Zn used in the present study were 3.09% and 52.0 mg/kg, respectively, followed the upper continental crust values reported by Wedepohl  and the K represents for the factor of 1.5 value due to lithogenic effects . Me/Fe sample = the metal to Fe ratio to be analyzed. Me/Fe background = the metal to Fe ratio which involved the background reference value, as mentioned above. For the reading of EF, the EF which is less than 2 is the depletion to minimal enrichment. Whereas, the 2 ≤ EF < 5 categorized as moderate enrichment, 5 ≤ EF < 20 categorized as significant enrichment, and 20 ≤ EF < 40 are very high enrichment. For EF > 40, they are extremely high enrichment . Cs = the examined Zn in the samples. Cn = the background reference values of Zn, as mentioned above. Tr = the factor of toxic response; In the present study, the Tr employed for Zn was 1.00 .
where Plant (Zn) is the Zn concentration in the plant tissue (leaves, stems or roots), and Soil (Zn) is the Zn concentration in the habitat topsoil. The Zn concentrations of C. asiatica (cited from ) and in their habitat topsoils are presented in (Table 2). Overall, there were two sampling sites (PPauh and Butterworth) that exceeded 300 µg/g dw in the leaves and roots of the plants. For stems, higher levels of Zn were found in three sites (Butterworth, Seremban and Pontian). Therefore, Butterworth was consistently found to have highest levels of Zn in leaves, stems and roots of the plants. Table 2. Concentrations (mean ± SD, µg/g dw) of Zn in leaves, stems and roots of Centella asiatica and four geochemical fractions in the habitat tosoils. Note: Zn data in the leaves, stems and roots of Centella asiatica and their habitat topsoils were cited from Ong et al. . F1= easily, freely or exchangeable fraction (EFLE); F2= acid-reducible (AR); F3= oxidisable-organic (OO); F4= resistant (R) fractions; SUM= summation of F1, F2, F3 and F4; NR= nonresistant fractions (F1 + F2 + F3). From Table 2, overall, the plant roots showed the highest Zn accumulation followed by leaves and stems. Those results were supported by . It has been reported that about 30 µg/g dw of Zn is adequate for plant growth and 300 to 500 mg/kg of Zn is considered toxic to the plants . The physiological disorders and metabolic abnormalities in plants could be resulted from excessive exposure of Zn . Therefore, Zn might be accumulated in the roots and be unable to enter the plant by being kept in the root cells where they would be detoxified by forming complexes or sequestered into vacuoles . This action greatly restricted the translocation of metals to the above-ground organs. Moreover, it could protect the leaf tissues and the metabolically active photosynthetic cells from Zn toxicity . In comparison to the geochemical factions, this is well supported by the highest levels if Zn in EFLE (F1), OO (F3) and resistant (R) fractions of the topsoils. This is again supported by the total summation of all fractions and non-resistant fraction. Hence, these comparisons indicated the use of different parts of C. asiatica as a good biomonitor of Zn. In order to see the close relationships of Zn levels between the plants ad topsoils, the graphical relationships of Zn between the both parameters are presented in Fig. (2) (based on leaves), Fig. (3) (based on stems) and Fig. (4) (based on roots). Based on the relationships of plant leaves and geochemical fractions Fig. 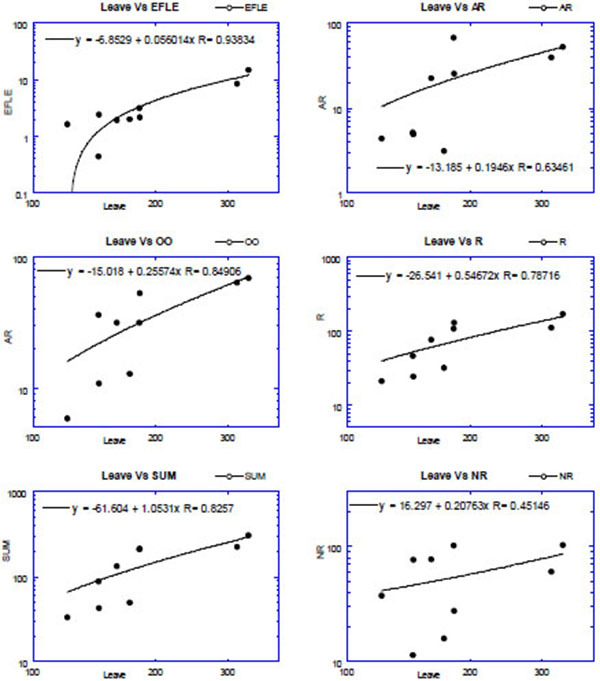 (2), it is found that Zn levels in the leaves significantly (P< 0.05) correlated with EFLE (R= 0.94), AR (R= 0.63), OO (R= 0.85), R (R= 0.79) and SUM (R= 0.83). Based on the relationships of plant stems and geochemical fractions Fig. (3), it is found that Zn levels in the stems significantly (P< 0.05) correlated with AR (R= 0.73), R (R= 0.75) and SUM (R= 0.72). Based on the relationships of plant roots and geochemical fractions Fig. (4), it is found that Zn levels in the roots significantly (P< 0.05) correlated with EFLE (R= 0.88), AR (R= 0.65), OO (R= 0.86), R (R= 0.77) and SUM (R= 0.82). These results indicated the three parts of C. asiatica are able to reflect the Zn concentrations in the habitat topsoils. 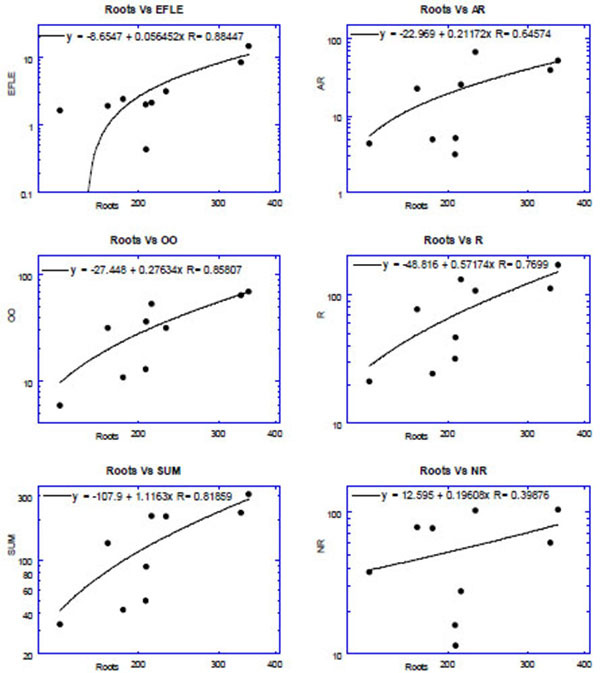 The positive relationships of Zn between soil non-resistant fractions (EFLE, AR and OO) and plant root indicated a close relationship between soil Zn concentration and root metabolism, which should be further examined to understand how soil Zn concentration can impact root Zn accumulation efficiency. According to , when soil metal concentration exceeds the plant tolerance, growth and metabolism will be inhibited and eventually the plant species will be excluded from the site vegetation assemblage even though there is a seed existing in the regional pool. Therefore, the roots, leaves and stems of C. asiatica are good biomonitors of Zn pollution in the environment. Table 3. The values of geochemical indices based on the Zn levels in the habitat topsoils of Centella asiatica. Fe concentrations are presented in %. Note: EF= enrichment factor; Igeo= geoaccumulation index; Cf= contamination factor; Er= ecological risk. Data of Zn and Fe in the soils were cited from Ong et al. . Fig. (2). Relationships of Zn between leaves of Centella asiatica and different geochemical fractions of habitat topsoils, based on log10 axes of x and y. Fig. (3). 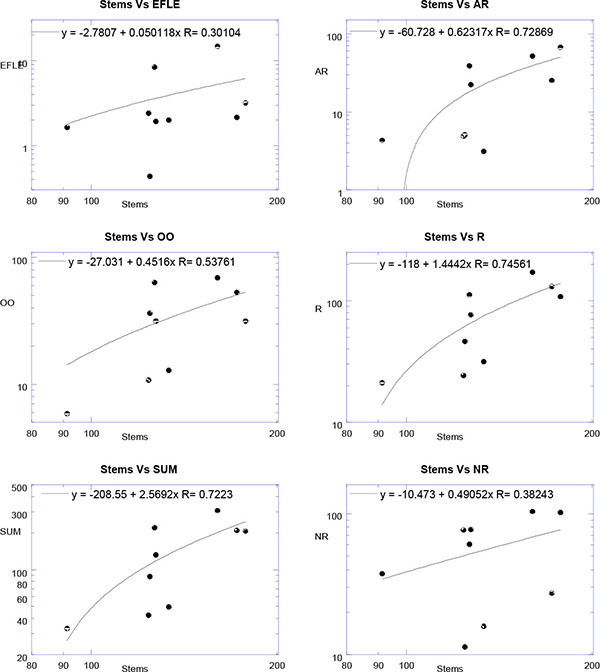 Relationships of Zn between stems of Centella asiatica and different geochemical fractions of habitat topsoils, based on log10 axes of x and y. Fig. (4). Relationships of Zn between roots of Centella asiatica and different geochemical fractions of habitat topsoils, based on log10 axes of x and y. The geochemical indices for EF, Igeo, CF and ER of the topsoils are presented in (Table 3). For EF, there are three sites (PPauh, Butterworth and Pontian) with classification of ‘moderate severe enrichment; 5-10’ (Table 4). Also, there are two sites with ‘moderate enrichment’, one site with minor enrichment and others with ‘no enrichment’, according to Taylor  classification. Table 4. Grading standards for enrichment factor (EF; Taylor ), geoaccumulation index (Igeo; Muller ), contamination factor (Cf; Hakanson ) and potential risk index for individual metal (Er; Hakanson ). For Igeo, there are four sites (PPauh, Butterworth, Seremban and Pontian) with classification of ‘moderate polluted; 1-2’ (Table 4). Also, there are two sites with ‘Unpolluted to moderately polluted’ while others with ‘unpolluted’, according to Muller  classification. For Cf, similarly there are four sites (PPauh, Butterworth, Seremban and Pontian) with classification of ‘Considerable contamination factor; 3-6 (Table 4). Also, there is one site with ‘Moderate contamination factor’ while others with ‘Low contamination factor’, according to Hakanson  classification. For Er, all sites were below 40 with ‘Low potential ecological risk’ according to Hakanson  classification. Ratios of nonresistant/resistant (NR/R) are given in (Table 5). Based on NR/R, the topsoils from two sites (Kluang and Kapar) are found to have been dominated (> 1.00) by nonresistant fraction of the soils while the rests are mostly originated from natural sources (< 1.00). Table 5. Ratios values calculated from the present study. Note: NR/R= ratios of nonresistant to resistant fractions of the topsoils. The three values of accumulation efficiency (BCF) are presented in (Table 5). The ratios of leave/soil (BCF-1), stem/soil (BCF-2) and root/soil (BCF-3) varied from 0.87-3.66, 0.52-2.90, and 1.01-4.34, respectively. Based on six dominant plant species, Qian et al. reported the ratios of BCF (root/soils) varied from 0.56 to 10.8. Higher Zn concentration in plant parts demonstrated that the amount of Zn accumulated in the plant parts is positively related to Zn concentrations in the topsoils. This was consistent with the results from other studies with other metals such as Cd, Ta and V  and V . Hence, present three values of BCF indicated accumulation efficiency of Zn in the leaves, stems and roots of C. asiatica. Based on some established soil sediment guidelines for Zn, four sampling sites (PPauh, Butterworth, Seremban and Pontian) had exceeded Canadian soil quality for agricultural use (200 µg/g dw)  while Butterworth exceeded the Chinese soil quality standard (250 µg/g dw) . The rest of the sampling sites were found to be below Target value (140 µg/g dw, the baseline concentration value that considered not affecting the natural properties of the soil) according to Dutch soil guideline . Based on the present data, all sampling sites were found to be lower than middle value (430 µg/g dw, a threshold value for further investigation) and intervention value (720 µg/g dw, the maximum tolerable concentration that remediation is required), according to Dutch soil guideline . In Malaysia, industries in Malaysia such as electronics, textiles, food processing and rubber based industry contribute the Zn contamination to the environment . The use of fungicides and fertilizers containing organo-zinc could have caused the excess to leach into the soil . Soils near highways and smelters contained high Zn concentrations as a result of deposition of Zn released in tire abrasion and stack emissions . Zn level in soils was reported decreased with distance from the point source of pollution (CCME, 1999). Therefore, higher level of Zn can be found in nearby of the Zn contamination source. Previously, Warne et al. reported the Zn concentrations are found in the ranges of Zn between 150-300 µg/g dw in the polluted soils. Wang and Qin [32, 33] reported Zn ranges 53-380 μg/g dw in urban topsoil of Xuzhou (China) while Yap and Pang  reported the Zn ranges as 88.7-484 μg/g dw in river drainage surface sediments collected from the north western aquatic area of Peninsular Malaysia. Yap et al. [34, 35] reported the Zn ranges as 50–336 μg/g dw and 330-484 μg/g dw for intertidal and drainages in Selangor, respectively. All the above studies explained the higher or elevated levels of Zn were related to anthropogenic inputs that had increased the levels of Zn in soils. Therefore, present findings are comparable to the above reported data. This has given a strong indication of Zn contamination in Malaysian topsoils that should be given be concern from environmental management point of view . Present study investigated the relationships of Zn concentrations between three parts (leaves, stems and roots) of Centella asiatica and their habitat topsoils. Based on Er of the habitat topsoils, all samplings sites were categorized as ‘Low potential ecological risk’ according to Hakanson  classification. Based on the positive significant relationships of Zn concentrations between plant parts and geochemical fractions of their habitat topsoils, present study indicated that C. asiatica can be used as biomonitoring plant of Zn polluted topsoils. The authors wish to acknowledge the financial support provided through Research University Grant Scheme (RUGS) [Vote no. 9322400] by Universiti Putra Malaysia, and also Fundamental Research Grant Scheme (FRGS) [Vote no. 5524953] by Ministry of Higher Education Malaysia. Weis JS, Weis P. Metal uptake, transport and release by wetland plants: implications for phytoremediation and restoration. Environ Int 2004; 30(5): 685-700. Colangelo EP, Guerinot ML. Put the metal to the petal: metal uptake and transport throughout plants. Curr Opin Plant Biol 2006; 9(3): 322-30. Wu G, Kang H, Zhang X, Shao H, Chu L, Ruan C. A critical review on the bio-removal of hazardous heavy metals from contaminated soils: issues, progress, eco-environmental concerns and opportunities. J Hazard Mater 2010; 174(1-3): 1-8. Ebbs SD, Kochian LV. Toxicity of zinc and copper to Brassica species: Implications for phytoremediation. J Environ Qual 1997; 26: 776-81. Brinkhaus B, Lindner M, Schuppan D, Hahn EG. Chemical, pharmacological and clinical profile of the East Asian medical plant Centella asiatica. Phytomedicine 2000; 7(5): 427-48. Yap CK, Ismail A, Tan SG. Cd and Zn concentrations in the straits of Malacca and intertidal sediments of the west coast of Peninsular Malaysia. Mar Pollut Bull 2003; 46(10): 1349-53. Yap CK, Pang BH. Assessment of Cu, Pb, and Zn contamination in sediment of north western Peninsular Malaysia by using sediment quality values and different geochemical indices. Environ Monit Assess 2011; 183(1-4): 23-39. Ong GH, Yap CK, Maziah M, Tan SG. Accumulation of heavy metals and antioxidative enzymes of Centella asiatica in relation to metals of the soils. J Trop Agric Sci 2013; 36(4): 311-36. Yap CK, Ismail A, Tan SG, Omar H. Correlations between speciation of Cd, Cu, Pb And Zn in sediment and their concentrations in total soft tissue of green-lipped mussel Perna viridis from the west coast of Peninsular Malaysia. Environ Int 2002; 28(1-2): 117-26. Badri MA, Aston SR. Observation on heavy metal geochemical associations in polluted and non-poluted estuarine sediments. Environ Poll 2002; 6(Series B): 181-93. Muller G. Index of geoaccumulation in sediments of the Rhine River. GeoJournal 1969; 2: 108-18. Wedepohl KH. The composition of the continential crust. Geochim Cosmochim Acta 1995; 59: 1217-32. Martin JM, Whitfield M. The significance of the river input of chemical elements to the ocean. In: Wong CS, Boyle E, Brul KW, Burton JD, Goldberg ED, Eds. Trace metals in sea water. New York: Plenum 1983; pp. 265-96. Sutherland RA. Bed sediment-associated trace metals in an urban stream, Oahu, Hawaii. Environ Geol 2000; 39(6): 611-27. Hakanson L. An ecological risk index for aquatic pollution control. A sedimentological approach. Water Res 1980; 14: 975-1001. Dowdy DL, McKone TE. Predicting plant uptake of organic chemicals from soil or air using octanol/water and octanol/air partitioning ratios and a molecular connectivity index. Environ Toxicol Chem 1997; 16: 2448-56. Kim IS, Kang KH, Johnson-Green P, Lee EJ. Investigation of heavy metal accumulation in Polygonum thunbergii for phytoextraction. Environ Pollut 2003; 126(2): 235-43. Qian Y, Gallagher FJ, Feng H, Wu M, Zhu Q. Vanadium uptake and translocation in dominant plant species on an urban coastal brownfield site. Sci Total Environ 2014; 476-477: 696-704. Yap CK, Mohd Fitri MR, Mazyhar Y, Tan SG. Effect of metal-contaminated soils on the accumulation of heavy metal in different parts of Centella asiatica: A laboratory study. Sains Malay 2010; 39: 347-52. Miransari M. Hyperaccumulators, arbuscular mycorrhizal fungi and stress of heavy metals. Biotechnol Adv 2011; 29(6): 645-53. Singh BK. Studies on variability and heterosis of important economic and nutritive traits in cabbage PhD Thesis. New Delhi, India: IARI, Pusa 2007. Hall JL. Cellular mechanisms for heavy metal detoxification and tolerance. J Exp Bot 2002; 53(366): 1-11. Sgherri C, Cosi E, Navari-Izzo F. Phenols and antioxidative status of Raphanus sativus grown in copper excess. Physiol Plant 2003; 118(1): 21-8. Gallagher FJ, Pechmann I, Bogden JD, Grabosky J, Weis P. Soil metal concentrations and vegetative assemblage structure in an urban brownfield. Environ Pollut 2008; 153(2): 351-61. Taylor SR. Abundance of chemical elements in the continental crust: a new table. Geochim Cosmochim Acta 1964; 28: 1273-85. CCME (Canadian Council of Ministers of the Environment). 1999. Canadian Environmental Quality Guidelines. Canadian Council of Ministers of the Environment, Winnipeg, Manitoba. Circular on target values and intervention values for soil remediation Annex A: target values, soil remediation intervention values and indicative levels for serious contamination. Dutch Ministry of Housing, Spatial Planning and Environment 2000. Alkarkhi AF, Ismail N, Ahmed A, Easa Am. Analysis of heavy metal concentrations in sediments of selected estuaries of Malaysiaa statistical assessment. Environ Monit Assess 2009; 153(1-4): 179-85.
 WHO (World Health Organization). 2001. Zinc. Environmental Health Criteria 221. World Health Organisation, International Programme on Chemical Safety (IPCS), Geneva, Switzerland. Norrstrom AC, Jacks G. Concentration and fractionation of heavy metals in roadside soils receiving de-icing salts. Sci Total Environ 1998; 218: 161-74. Warne MS, Heemsbergen D, Stevens D, et al. Modeling the toxicity of copper and zinc salts to wheat in 14 soils. Environ Toxicol Chem 2008; 27(4): 786-92. Wang XS, Qin Y. Some characteristics of the distribution of heavy metals in urban topsoil of Xuzhou, China. Environ Geochem Health 2007; 29(1): 11-9. Martin HW, Kaplan DI. Temporal changes in cadmium, thallium, and V mobility in soil and phytoavailability under field conditions. Water Air Soil Pollut 1996; 101: 399-410. Yap CK, Fairuz MS, Cheng WH, Tan SG. Distribution of Ni and Zn in the surface sediments collected from drainages and intertidal area in Selangor. J Trop Agric Sci 2008; 31(1): 79-89. Yap CK, Pang BH, Fairuz MS, Hoo YI, Tan SG. Heavy metal (Cd, Cu, Ni, Pb and Zn) pollution in surface sediments collected from drainages receiving different anthropogenic sources from Peninsular Malaysia. Wetland Sci 2007; 5(2): 97-104.